Home » India » Can one Whatsapp Message make India rich? Today I received Whatsapp message saying that India can be rich country if people of India follow advice given in this message for 90 days. 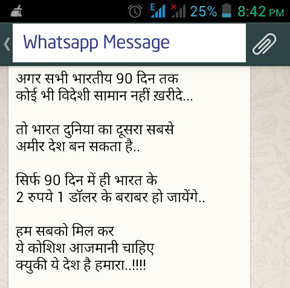 Let me share partial content of Whatsapp message with you. “अगर सभी भारतीय 90 दिन तक कोई भी विदेशी सामान नहीं ख़रीदे… तो भारत दुनिया का दूसरा सबसे अमीर देश बन सकता है.. सिर्फ 90 दिन में ही भारत के 2 रुपये 1 डॉलर के बराबर हो जायेंगे.. हम सबको मिल कर ये कोशिश आजमानी चाहिए क्युकी ये देश है हमारा..!!!! Dollar is not getting stronger, rupee is getting weaker! & nobody else is responsible for d fall, except us! Stop drinking them, Drink Lemon Juice, Lassi, Fruit juice, butter milk etc. instead of Coke, Pepsi. 2. Use Soaps such as Cinthol, Santoor,Medimix, Neem, Godrej brands instead of Lux, Lifebuoy, Rexona, Liril, Dove, Pears, Hamam & Palmolive! Aren’t you responsible for fall of rupee..
Samsung S4 at Rs 41,000. Same features Micromax Canvas comes at Rs 17,000 means you waste Rs 24,000 and these 24,000 goes to South Korea in dollars. None of the Indian products are substandard in quality, they might look a bit less fancy!! Why is china so ahead, because the whole world uses made in china items. We Indians should use made in India items! Change comes from within! Spread the change by broadcasting this message to everyone on your contact list! Whatsapp Message given above is partial message you can view full message here. On my study I found that currency exchange rates depends on various factor such as import, export, inflation, interest rates, growth rate, trade deficit, foreign exchange reserves, macroeconomic policies, foreign investment inflows, banking capital, commodity prices and geopolitical conditions. Extensive use of imported items creates higher demand for imported goods and can increases demand for foreign currencies and weakens the local currency. Thus we should avoid use of imported goods. Use of Indian product is also important for GDP (Gross Domestic Product) growth. From my point of view use of Indian Item can make partial difference on rupee price but at long run can make our country richer. What do you Say:- Use of Indian Item can make our country rich?